This post follows on from my previous post about upper body strengthening to aid and rebalance your yoga practice. Exactly the same principles apply in the lower body. As yogis we can get a bit obsessed with forward folds and hip openers. I know being able to bite your toes or fold in half is a really cool trick. And I know hip openers can feel really juicy and like they are doing us loads of good (and in some cases they may well be). 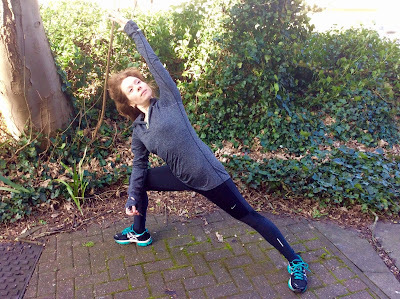 If we are always pushing to get further/ deeper into these poses without strengthening at the same time then we can run the risk of overstretching / weakening / injuring ourseleves. Particularly the hamstrings, glutes and pelvic / knee stability. Below are my top 3 lower body exercises to help your lower body stay supple AND strong.They can all be done at home with some dumbells if you don't have access to a gym. Choose weights that are appropriate for you, if you're new to weights start light and see how you go. Make sure you warm up first! Do consult a medical professional if your are unsure if these exercises are right for you. Try 3 sets of 10-15 reps of each exercise 2-3x per week and let me know how you get on! If you've every tweaked / torn a hamsting (me included!) then you'll know that they can be pretty painful and take a while to heal. It might seem counter intuitive but eccentric contractions (where the muscle is lengthening under a load) are a great way to not only gain functional strength but also to help rehab muscle tweaks and tendon sprains becuse the help orentate the healing fibers the right way. Stand with your feet hip width apart holding a barbell or pair of dumbells in your hands, arms straight, palms facing back towards your hips. Your shoulders should be slightly down and back, pushing your chest out. With a slight bend in your knees, hinge at your hips, keeping your back straight and lower the weight/s down the front of your legs until you feel a slight stretch in your hamstrings. Squeeze your glutes (bum) and use your hamstrings to come back up to stand. Sqauts are fab, they help strenthen the glutes, quads, hamstings and calves.They also work out your core, stabilizing muscles, which improves the communication between your brain and your muscle groups increasing stability around the hip, knee and ankle joints. Stand with your feet a little wider than shoulder width apart. Hold a weight against your chest, with your elbows tucked in. If you’re using a dumbbell, hold it vertically. If it’s a kettlebell, hold the sides of its handle. Go as low as you can in this position, then come back up, pushing through your heels. Keep your movements smooth and your abs engaged throughout. Stand with your feet shoulder width apart. Your hands should be on your hips or if you're using weights holding them by your sides. Look directly forward, keeping your chest lifted. Start the lung by taking a step back, contacting the floor with the ball your foot, allowing your knees to bend to lower your body. Keep lowering until your knee nearly touches the ground. Move slowly with control paying attention to the your alignment. Your front knee should stay stacked over your ankle in line with your foot, your hips level and your upper spine should remain neutral. Do you use you yoga as your main form of physical activity? Do you have niggles in your shoulders, wrists, or elbows when you practice? If yes then you might benefit from adding some upper body strength training into your practice. Yoga is wonderful and has many benefits for mind and body. However, yoga practice tends to neglect some movement patterns and overemphasis others which can lead to imbalances developing in the body. As yogis it's easy for us see how yoga can benefit other athletes but perhaps it's time to recognise how other forms of fitness can help us. Below are my favourite upper body strengthening exercises to complement the areas yoga tends to miss. They can all be done at home with some dumbells and a theraband if you don't have access to a gym. Choose weights that are appropriate for you, if you're new to weights start light and see how you go. Do consult a medical professional if your are unsure if these exercises are right for you. Broadly speaking (unless you do aerial yoga or have access to an Iengar rope wall) yoga lacks pulling movements. We do loads of pushing in chaturanga, plank, downdog, and arm balances but very little pulling. Pulling is to pushing what back bending is to forward bending. a fantastic way to balance the shoulders and back , creating strength and mobility. Or if you can't do pull ups do assisted pull ups or an active hang where you retract shoulder blades and get your lats involved. If you don't have access to a bar then you can use a pull down machine in the gym or loop a theraband over the top of a door. The point is start PULLING to balance out the all the pushing. These strengthen the shoulders and upper back.Plus, because they are done with free weights which require more control they also recruit the stabilising muscles of the wrists and elbows which is great news if you practice arm balances as well and downdog and plank. Stand with your feet shoulder-width apart and a dumbbell in each hand. Hold the dumbbells up by your shoulders, with your elbows out at a 90-degree angle. Without leaning back, extend through your elbow and raise the weights directly above your head. Then slowly return to the starting position. Aim for three sets of 10-12 reps.
Another pulling exercise :) - these help strengthen your entire back (upper middle and lower) plus shoulders, biceps and triceps. With a dumbbell in each hand (palms facing your torso), bend your knees slightly and bring your torso forward by bending at the waist; as you bend making sure to keep your back straight and your core engaged. The weights should hang directly in front of you as your arms hang perpendicular to the floor and your torso. This is your starting position. While keeping the torso stationary, lift the dumbbells to your side. keeping the elbows close to the body. Slowly lower the weight again to the starting position as you inhale. These help take care of the rotator cuff (the set of 4 muscle and tendons that keep the head of the humerus in the glenoid fossa or shoulder socket). The rotator cuff is really important for both shoulder stability and smooth movement. Unfortunately repeated chaturangas and planks place alot of stress on the rotator cuff. In particular, the muscle at the front (subscapularis) which controls internal rotation. Use these internal rotation exercises to help strengthen and balance your rotator cuff. Hold a light dumbbell or cable handle attachment in one hand with the elbow of that particular arm creating a 90 degree angle between your upper arm and your forearm. Your forearm should be parallel to the floor and your elbow should be tucked against your side. Internally rotate your forearm (i.e bring your fist inwards, across your body) ensuring it stays parallel to the floor. Hold the contracted position before rotating externally to return to the starting position. Repeat for 3 sets of 12 – 15 repetitions per arm. Hope you've found this post useful! Part 2 - exercises for the lower body coming soon! Practiced mindfully yin yoga can be a wonderful way to enhance somatic awareness, relaxation and a sense of proprioception. Yin yoga is much less about making a 'correct' target shape and much more about finding the right shape for YOU to explore. Everybody is unique. How far we can go into, and the kind of sensations we experience a yin pose vary widely from person to person. So how do we practice sensitively to get the most from a yin yoga class? Below are 4 key points to keep in mind when practicing yin yoga to have a safe and beneficial class. • Start at an appropriate depth – especially when new to the practice it is important to be kind to the body. Go to a point where you feel a gentle stretch (4 to 6 /10 intensity), stop and wait. You may like to use props to help support The long holds can significantly change the sensations experienced during the pose. • Breathe with your whole body. Use your breath to help you soften into the poses. Your breath is also a very good indicator if your depth is appropriate. If you find you can’t breathe smoothly and easily the chances are you are in a little too deep and it's a good idea to ease out a little. • Be mindful of the sensations happening in your body as you hold the pose. Notice how they change, in intensity or if they travel and make adjustments accordingly. If something starts to feel too much, or you start to feel any numbness / tingling ease out, if you feel your body opening maybe you might like to move a little deeper. • Cultivate stillness in mind and body. This can be the hardest part! Yin teaches you how to stay with something even if it not totally comfortable. This staying helps train the mind to be more focused and allows a deeper awareness of the body to develop. Thanks for reading and I hope you found this post helpful. Wishing you a wonderful yin practice! What do Andy Murray, the New Zealand All Blacks, and Paula Radcliffe all have in common? They are all top athletes who practice yoga to help them stay in peak physical condition. But, why is yoga so beneficial for athletes? Read on to find out more…..
Three of the most obvious benefits of yoga are relaxation, increased flexibility and breath control. Being supple as well as strong, the ability to stay cool under pressure and the ability to regulate your breath are key for any athlete. However, there are a whole host of more subtle benefits that come from a regular yoga practice which lead to an enhanced sense of body awareness. The benefits include improved coordination, balance and proprioception (our sense of where we are in space). Athletes, of any level, need to prevent and recover from injury and enhanced body awareness is the foundation for this. In terms of injury prevention an athlete with enhanced body awareness is more likely to move smoothly and in harmony with their own biomechanics therefore reducing the risk of overuse injuries. If a niggle starts to develop during training it’s often very tempting to try and push through but they are able to stop, assess and adjust to avoid it developing into something major. Good balance and reflexes reduce the risk of trips and give a better chance of self-righting if you do start to fall. But what happens if the worst comes to the worst and you develop an injury? Yoga can still help with that! The key for effective rehab is rest in the very early stages and then (and this is the tricky part) enough movement to help the tissue fibres heal correctly but not so much as to re-injure them. Yoga can provide safe and low impact cross training during recovery, plus the enhanced body awareness can help the athlete better sense how much movement / pressure their injury can safely take during the rehab process. So if you’re an athlete of any level why not give yoga a try? You might be surprised by the results. If you have an injury that is bothering you then I offer tailored yoga rehab and sports massage combi packages to get you back to peak condition as quickly as possible. I also offer yoga rehab workshops for sports clubs. Get in touch with me at kateyinyoga@gmail.com for more info. We are all beings of light. Our cells emit low intensity 'packets of light' called biophotons, in the UV and visible regions of the electromagnetic spectrum. Yes you read that correctly, humans emit light and not just any kind of light. The biophotons we emit are highly coherent and can communicate with themselves and their surroundings on a quantum level . The full scope of biophotons within the body hugely complex and still not fully understood, but we know they are a key method of cellular communication and may even explain the unification of cells within the body. Suddenly the traditional image of a meditating yogi radiating light in perfect harmony with themselves and the universe doesn't seem so far fetched after all! Except that levels of biophoton emission seem to be the opposite of what one might expect. Biophoton emission is actually lower than average in regular meditators  and higher than average in those who are sick  and on the affected side of stroke patients. Almost as if our inner light drains out of us when our bodies are under stress. Cell growth where the DNA splits to allow its information to be duplicated. Damage to the DNA itself due to toxic chemicals or radiation. So what does this mean for us as meditators? Simply put this even more evidence for the healing benefits of meditation! 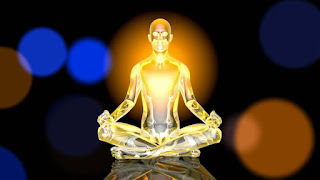 Regular meditation reduces inflammation, and free radical levels in the body. Free radicals are highly reactive chemicals that damage cells and DNA. Lower free radical levels lead to less cell and DNA damage, and decreasing biophoton emission. In modern life our bodies are being bombarded with free radicals like never before from pollution, pesticides, certain food additives, cosmetics etc.The power of meditation to reduce the impact of these chemicals on our systems and potentially help heal or reduce the risk of inflammation related disease should not be underestimated. Another amazing property of biophotons is that they can be influenced by our intention. A study in 2012 found that when subjects actively imagined light in a very dark environment their intention produced significant increases in biophoton emission from around their heads. This is huge as it is strong evidence that we can influence physical process with the power of our minds. Again this links back to meditation and has implications for our potential abilities to direct healing around our bodies. To conclude, biophotons are an amazing, hugely complex and surprisingly under researched phenomenon of life. They are in overarching cellular communication, a measure of health, potentially instrumental in healing and can be influenced by our minds. There appears to an amazing synergy between their properties and the effects of meditation. And again meditation is proved to have enormous benefits for our wellbeing with the power to protect and harness our inner light. B. Ruth, F.A. Popp, Experimentelle Untersuchungen zur ultraschwachcn Photonenemission biologi~her Systeme, Zeitschrift Naturlbrschung, 1976, 3 Ic 741-745. Cohen, S., Popp, F.A. Biophoton emission of the human body. Journal of Photochemistry and Photobiology B: Biology, 1997, 40(2): p187. Cell Biophysics, 1984, 6(1): p33. 'Reach your arms overhead and bring you shoulder blades down your back.' How often do you hear this well intentioned cue or something similar uttered in a yoga class? Probably fairly often, and as a teacher I know I have said it plenty of times. In theory it's a good cue aimed at preventing students hunching their shoulders up around their ears when they bring their arms overhead or move into downward facing dog. Instead of hunching, we would like our students to feel breadth across the back of their shoulders and free around their necks. However, what we are actually asking our students to do is dislocate their shoulders! 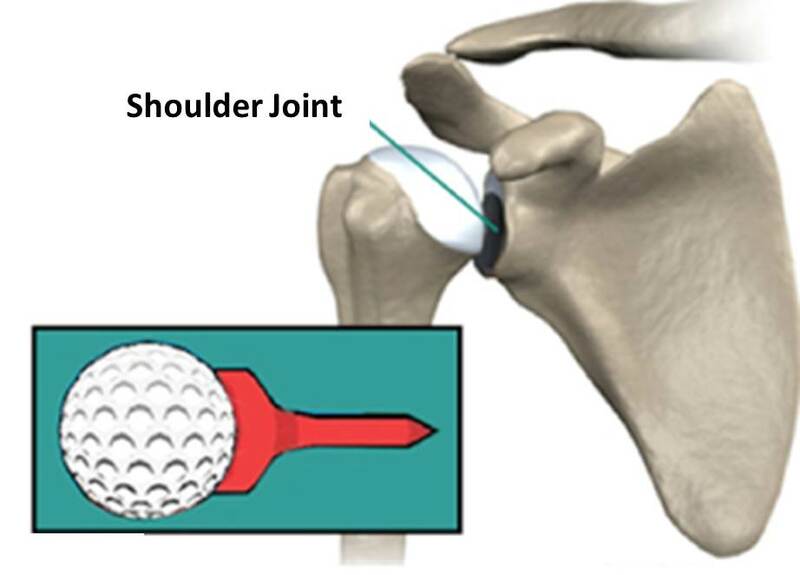 Unlike the hip, the shoulder is optimized for mobility rather than stability. That means instead of there being a nice deep socket for the head of the upper arm bone (humerus) to sit into there is only a small shallow area on the side of the shoulder blade (scapula). A bit like a golf ball in a tee, see below. So if you start trying to bring the shoulder blades down while the arms are raised, the head of the upper arm bone starts to separate from its socket on the shoulder blade. Not the healthiest movement pattern to be promoting, especially for anyone with shoulder instability. As teachers we would still like to discourage hunched shoulders in down dog or warrior one, so what to cue instead? Happily mother nature is already one step ahead. The shoulder blade naturally rotates outwards once the arms get past 90 degrees. This is to avoid the bony projections above the shoulder joint blocking the movement of the arm bone as it elevates further as shown in the photo sequence below. We can still cue our shoulders, or our students shoulders, not to hunch but by encouraging the natural rotation of the shoulder blade instead. A helpful cue in downward dog might be: 'Wrap your shoulder blades around towards you underarms'. In warrior one 'Roll your little fingers in towards each other'. By shifting the focus from down to breadth we can work with the body not against and still achieve open shoulders and free necks. Try it and see what you think! Back pain is the second most common reason for long term sickness in the UK and costs the NHS millions annually. Yet it is often very difficult to identify an origin for the pain and up to 85% of sufferers show no identifiable cause. These cases are lumped under the umbrella of 'non-specific back pain'. This type of is pain is from cumulative injuries, caused by a variety of factors including poor posture, repetitive movements, too much sitting, obesity and psychosocial considerations. The latest NICE guidelines (published 6/1/17) for low back pain and sciatica recommend group yoga or tai chi classes as a main component of non-invasive treatment! This is brilliant news as it means the evidence is finally there to support what many yogis have known for years: yoga can be a very effective treatment for back pain. But what is it about yoga that makes it so powerful? For answers we need to look at the body's response to pain a little more deeply. Unfortunately because it is hard to pin down a cause of back pain it is often challenging to treat, leading to chronic pain conditions for millions of people. Once the pain becomes chronic a number of changes occur in the nervous systems, muscles affected and psychological state. These changes cause feedback loops which amplify or even cause pain even if the original cause has healed. One of the most significant feedback loops is the interplay between fear/hypervigilance of pain, muscle tension as a result of the fear, and ongoing pain which creates further inflammation and more pain. A schematic of this relationship can be seen in Figure 1, which clearly shows how treatment is unlikely to be successful unless these secondary factors are also addressed. The NHS and NICE now view chronic back pain as a multifaceted condition which requires a multifaceted treatment package. The good news is yoga can form a major part of that multifaceted treatment package in one go! One key piece of advice to those with chronic back pain is 'keep moving'. Yoga definitely helps with that, improving both core strength and flexibility. Increasing core strength is key because it reduces the load on the spine and back muscles, increasing flexibility and allowing people to move more freely. But, that's not all. At the heart of yoga is the connection of mind and body through breath which promotes relaxation and much greater internal awareness. Or in medical terms, yoga stimulates the parasympathetic nervous system or PNS (the system responsible for rest, digestion and healing). 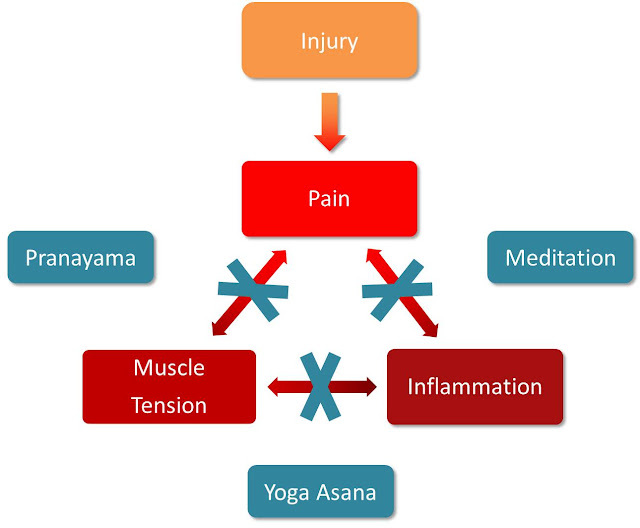 Different elements of yoga stimulate the PNS in different ways allowing all the elements of the secondary chronic pain feedback loop to be targeted simultaneously (see Figure 2). Pranayama connects mind and body, promoting relaxation. Meditation: teaches the mind to draw away from hypervigilance, easing over-sensitised neural pathways and decreases inflammation in the body. Figure 2. How yoga targets the chronic pain cycle. Additionally the shift away from painkillers and towards yoga as a first line intervention for back pain could dramatically reduce the amount of opiate painkillers prescribed. This is a huge benefit to patients as it avoids the potential side effects, and addiction risks of opiates. It also benefits the NHS in terms of reduced drug costs and demands on clinician time. To conclude, the inclusion of yoga in the NICE guidelines for low back pain and sciatica is a huge breakthrough for patients and for those of us who dream of seeing yoga thoroughly integrated into the NHS. Yoga has great potential as an intervention for many conditions and I hope this will be the first of many more NICE. 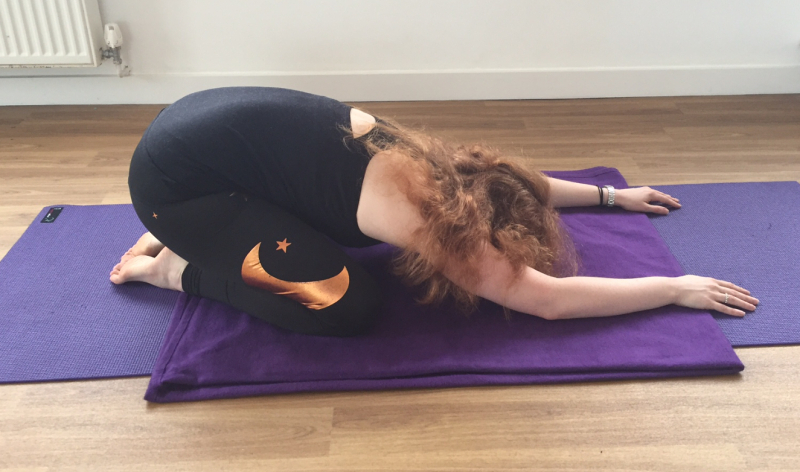 This blog was written in conjunction with the Minded Institute who are running a course on yoga therapy for low back pain and sciatica in April. In yoga we tend to talk a lot about muscles and connective tissue, but very little about bones. We talk about soft tissue being tight, stiff or flexible and how to change it. Often there is the underlying assumption that if you are diligent enough with your yoga practice then you will eventually be able to do any pose you wish. This assumption might be true if soft tissue was the only limiting factor in yoga. But that simply isn't the case, sometimes you come up against the hard portion of your anatomy: Bone. Skeletons are the framework for yoga practice. They are all uniquely proportioned and as yogis they define our individual limits. If your legs are much longer than your torso you will never be able to touch your nose to your toes in a forward fold no matter how flexible your hamstrings are. Or, if you come up against a hard 'bone on bone feeling as you move into to pose that is your anatomical end point. Hips are a key area where we can come up against this 'bone on bone' feeling and I'm going to explore the reasons in the remainder of this post. 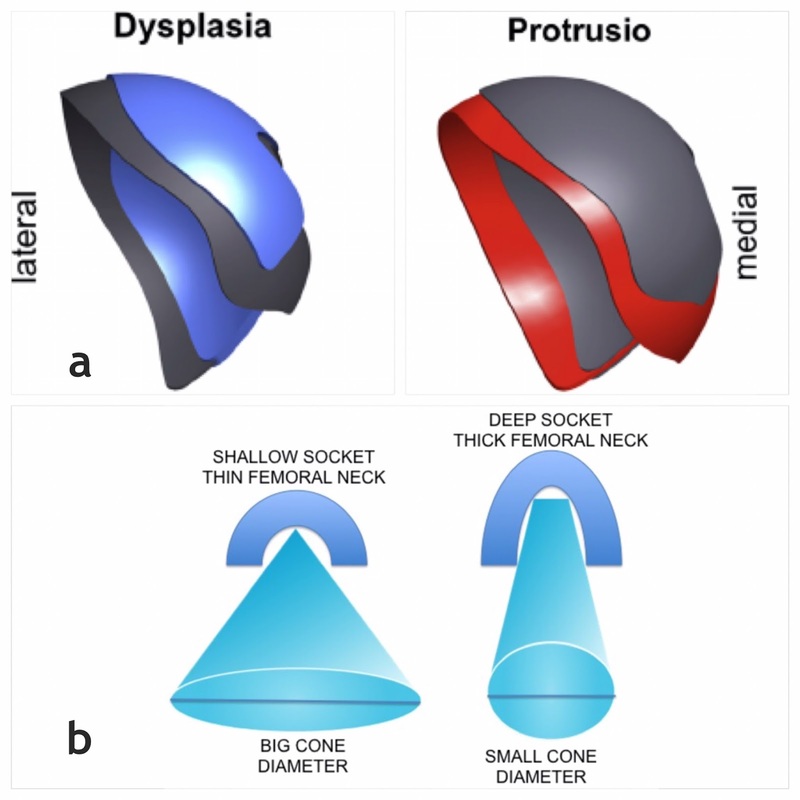 The shape and depth of the hip socket play a huge role in hip range of motion (ROM) as well. Figure 2.a, below shows scans from a hip imaging study . The blue shows a very shallow hip socket and the red a very deep one. Figure 2.b shows what happens to an individual's ROM when you take into account of the shape of the femur AND the hip socket. As can be clearly seen a shallow hip socket and narrow femoral neck allow a large ROM but with a deep socket and thick femoral neck the ROM is much reduced. But what does this mean for us as yogis? Simply put if you have the hip configuration on the left you poses which require a lot of hip ROM e.g. pigeon or cow face are likely to be quite easy easy for you but you may struggle more with poses that require a lot of stability eg tree or warrior three. If you have the hip configuration on the right then pigeon may be very difficult but balancing on one leg might seem like the most natural thing in the world! Figure 2. a) Shallow and deep hip sockets. b) Hip ROM combining shape of the femur and the hip socket. The point here is not to beat yourself up one way or the other but simply learn to work with your body as you practice rather than trying to force yourself into a position that might simply be impossible for your body. Give yourself permission to modify alignment to allow for your body geometry. Good yoga teachers should understand and respect this (provided you are not doing anything unsafe!) and be happy to provide modifications for you if you are unsure! For example, if you come up against a bone on bone feeling in pigeon then you could try moving the front knee out to the side more to give yourself more space.Or if you feel stuck in janu sirsasana try bringing your torso more to the inside or outside of your straight leg. In September I started a physiotherapy degree at Kings College London and dived deeply into the realms of human anatomy, physiology and disease. So far it has been fascinating, overwhelming and frustrating. Fascinating because the human body is amazing and it's a privilege to be learning about it in such detail. Overwhelming because I'm not sure how I'm going to memorise everything I'm being taught. And to find out about the frustration read on! As a yoga teacher and scientist I have a strong belief in the healing potential of yoga. I have seen it many times in the students I teach, in myself and in the growing body of scientific research into various therapeutic applications of yoga. I am always viewing the body from a yoga perspective as well as a physio perspective. I look for links between the two areas and ways yoga might help in some conditions. The more I learn, the more convinced I am that yoga could be beneficial in so many health conditions. But the greatest potential for yoga is in reducing one of the major pandemics of the western world; inflammation. 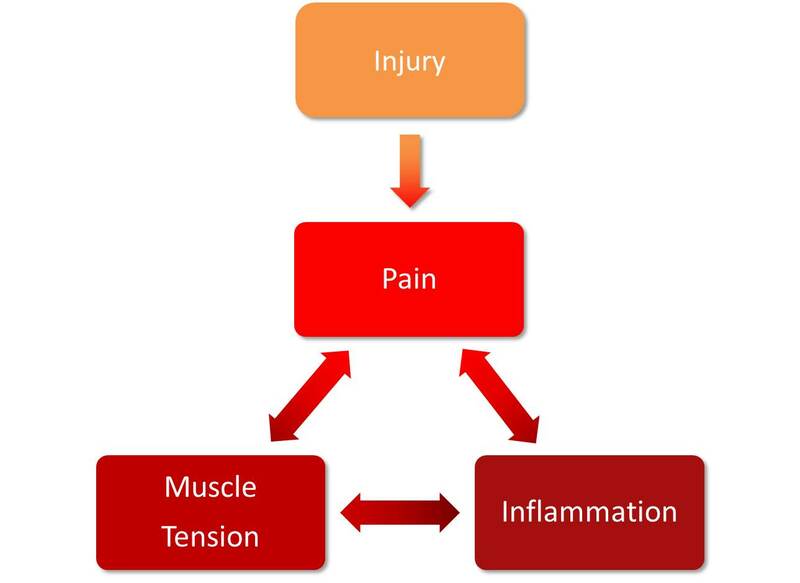 Inflammation is the single most recurrent theme in my course. Lecturers come back to it again and again when talking about things that can go wrong within the body and how to reduce inflammation when it has got out of control. Sometimes, the causes of inflammation are obvious e.g. as a result of a sprained ankle, but in other cases, such as a spontaneously occurring frozen shoulder, we simply don't know. We do know inflammation can affect any part of the body, muscle, nerves, connective tissue, joints etc. We know it is helpful as part of an acute healing response but extremely unhelpful if it becomes chronic, linking in to chronic pain and other issues. And we know diseases which cause inflammation in the body, stress and external irritants can all increase risk of other inflammatory conditions. However, reducing inflammation is very poorly understood, especially when it becomes chronic. Except yoga can do just that. Yoga and meditation have been proved to reduce inflammatory blood markers in patients with cancer1, heart failure2 and chronic pain3 and in members of the general population4. These are all rigorous studies published high impact journals and are just a snapshot of the wonderful research being done into the therapeutic benefits of yoga and meditation. But not once have they been mentioned as useful interventions in any of my lectures. A situation which I find incredibly frustrating! From a patient perspective, they are being denied drug free and enjoyable way to help treat themselves which has proven physiological and physiological benefits. For the cash strapped NHS yoga offers great potential as a cheap, safe and efficient (particularly group classes) way to reduce inflammation in patients with many different diseases. How yoga and meditation reduce inflammation will be the topic of a future blog, but now the evidence is available I don’t understand why it is taking so long for them to be routinely offered to patients. We are gradually starting to see some patchy inclusion but it’s still very much on the whim of individual hospitals and wards. My dream is to see yoga thoroughly integrated into the NHS and for that to happen it needs to start being included in NICE guidelines. A huge break though has happened with the most recent set of NICE guidelines for lower back pain which include yoga for the first time! Hopefully this will be the first of many more inclusions for yoga but it’s important to keep up the pressure. If you are a patient and think yoga could help especially if you are suffering from inflammatory conditions then talk to the health care professional/s (HCPs) treating you. One of the key priorities in the NHS is ‘client focused care’ e.g giving the patient as far as possible what they want. If there is increasing patient demand for yoga then more HCPs will start to listen. If you are a HCP be open minded about the benefits of yoga and maybe even have a look at some of the research out there. You might be surprised at the quality and the results! If you are a yoga teacher again why not investigate some of the research and keep you students informed. Finally if you are a researcher keep doing research the more we have the more convincing our arguments. I know from experience it can be quite difficult to get funding for this kind of research (I was tantalizingly close to doing a project on yoga for chronic pelvic pain which fell though at the last minute) but please keep trying and if anyone would like to collaborate on a project then please get in touch!! 1. J.K. Kiecolt-Glaser,. et al., “Yoga's Impact on Inflammation, Mood, and Fatigue in Breast Cancer Survivors: A Randomized Controlled Trial” Journal of Clinical Oncology, vol 32, no. 10, pp. 1040-1049, 2014. 2. P. Pullen, et al., “Effects of yoga on inflammation and exercise capacity in patients with chronic heart failure,” Journal of Cardiac Failure, vol. 14, no. 5, pp. 407–413, 2008. 3. A. Wren, et al., “Yoga for persistent pain: New findings and directions for an ancient practice,” Pain, vol. 152, no. 3, pp. 477–480, 2011. 4. P. Kaliman, et al., “Rapid changes in histone deacetylases and inflammatory gene expression in expert meditators,” Psychoneuroendocrinology, vol. 40, pp. 96–107, 2014. Edge, Time and Props: What is the Difference Between Yin and Restorative Yoga? There have been lots of discussions about yin vs. restorative yoga. Is one better than the other? Should you use props in yin? Where is the line drawn between the two? Personally, I feel the difference simply comes down to ‘edge’, ‘time’ and emphasis. As discussed in my previous post the emphasis in yin is a gentle stretching of the connective tissue while softening the muscles, in restorative yoga the emphasis being is deep relaxation with no strain in body or mind. Edge is used to describe the amount of sensation/stretch felt in the pose and time is the duration of the pose. For example, in a yin pose you might feel quite a strong edge in the target area of the pose and hold it for 3-5 minutes, in a restorative pose you might feel little or no edge and hold for 5-10 minutes. Props may be used to help the body stretch, strengthen, balance, relax or improve body alignment. Restorative yoga poses tend to involve a lot of props to ensure the body is completely supported and thus feels safe to completely relax. It also means the poses are comfortable to be in for extended periods of time. 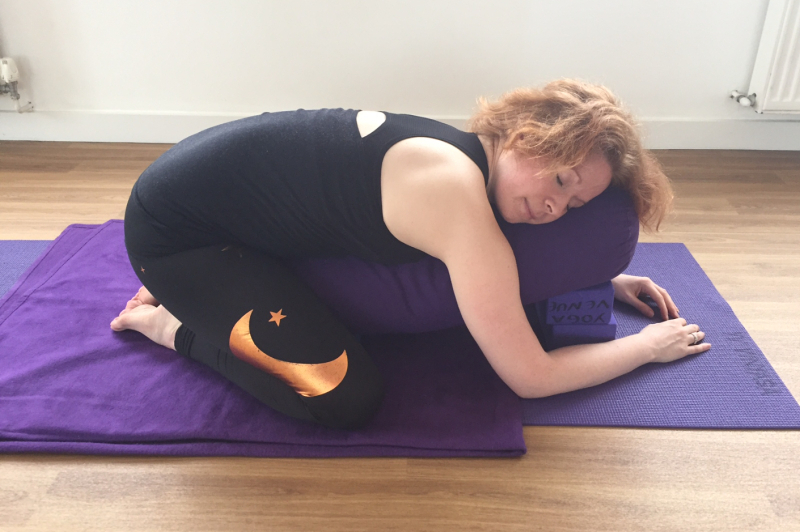 For example in the restorative child's pose pictured below; there is a blanket for padding under the knees, the abdomen and chest rest on the bolster which raised at one end to provide extra support for the head and neck. If desired extra blankets can be placed under the ankles and between the hips and heels. While fewer props are used in yin they can still be very important in helping students experience a pose more comfortably and safely. They allow students to hold an appropriate edge without over stretching (e.g. placing a rolled up blanket under the knees to protect tight hamstrings in a forward fold.) They can also be used to help relax other part of the body not directly involved, in particular supporting the head and neck so they are not dangling and adding additional strain to the shoulder girdle. In the yin version of child's pose below there is only a blanket under the knees for padding. If the forehead if it does not easily touch the floor, a block or folded up blanket my be placed underneath it to avoid straining the neck and back. Some people also enjoy having a block or blanket between their hips and heels for a little more support for the lower back. Yin and restorative yoga are both wonderful additions to a traditional yoga practice and offer peace from the hustle and bustle of everyday life. Why not come to class and give them a try? Yin, Yang and Yoga - What is Yin Yoga? Travel theme. Theme images by Michael Elkan. Powered by Blogger.